Inflammation has been implicated in ovarian carcinogenesis. This study evaluated two dietary indices: the Dietary Inflammatory Index (DII®) and the Empirical Dietary Inflammatory Pattern (EDIP), in relation to risk of developing, and survival following, a diagnosis of ovarian cancer. Data came from the Australian Ovarian Cancer Study (1375 cases, 1415 population controls). DII and EDIP scores were computed from dietary information obtained using a semiquantitative food-frequency questionnaire. Logistic regression was used to assess the association between DII and EDIP scores and risk of ovarian cancer and proportional hazards models were used for survival analysis. A high DII score, reflecting a more pro-inflammatory diet, was associated with a modest increased risk of ovarian cancer [odds ratio (OR) DII scoreQ4 vs.Q1 = 1.31, 95% CI 1.06–1.63, ptrend = 0.014]. Likewise a high EDIP score was associated with an increase in risk of ovarian cancer [OR EDIP scoreQ4 vs.Q1 = 1.39, 95% confidence interval (CI) 1.12–1.73, ptrend = 0.002]. We found no association between DII or EDIP score and overall or ovarian cancer-specific survival. In conclusion, our results suggest that a pro-inflammatory diet modestly increases the risk of developing ovarian cancer. The original version of this article was revised. On page 6, paragraph “Discussion”, line 4, ‘In a U.S. population-based case–control study (n = 493 cases) Peres et al., reported a non-significant association between DII score and risk of developing ovarian cancer of similar magnitude (OR DII scoreQ4 vs. Q1 1.35, 95% CI 0.93–1.97) ’. It should read as ‘In a U.S. population-based case–control study (n = 493 cases) Peres et al., reported a significant association between DII score and risk of developing ovarian cancer (OR DII scoreQ4 vs. Q1 1.72, 95% CI 1.18–2.51) ’. The online version of this article ( https://doi.org/10.1007/s00394-018-1779-x) contains supplementary material, which is available to authorized users. A correction to this article is available online at https://doi.org/10.1007/s00394-018-1816-9. We gratefully acknowledge the members of the Australian Ovarian Cancer Study Group including all the clinical and scientific collaborators, participating institutions, study nurses and research assistants (see http://www.aocstudy.org/ for a complete listing), and thank all of the women who participated in the study. We also acknowledge staff at the Australian Institute of Health and Welfare for conducting the linkage to the Australian National Death Index and Maria Celia Hughes from the QIMR Berghofer Medical Research Institute for preparation of the dietary data. 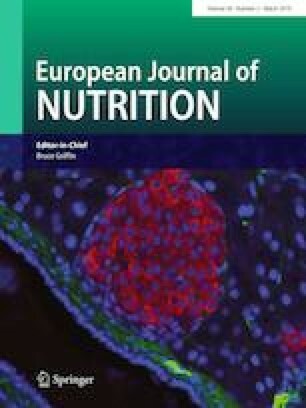 The authors’ responsibilities were as follows—CMN : designed the analysis, wrote the manuscript, and took responsibility for the final content; TI: was responsible for the dietary data including calculation of EDIP, and conducted the statistical analysis; AdF: was responsible for collection of the clinical data; NS and JRH calculated the DII and edited the manuscript; PMW designed the founding case–control study, contributed to the analysis and interpretation of the results; and all authors contributed to, reviewed, and approved the final manuscript. The Australian Ovarian Cancer Study was supported by the U.S. Army Medical Research and Materiel Command (DAMD17-01-1-0729), the National Health and Medical Research Council (NHMRC) of Australia (Grants 400281, 400413, 199600), the Cancer Councils of Victoria, Queensland, New South Wales, South Australia and Tasmania and the Cancer Foundation of Western Australia. CMN and TII were supported by NHMRC Program Grant, PMW by a fellowship from the NHMRC and AdeF was funded by the University of Sydney Cancer Research Fund and the Cancer Institute NSW through the Sydney-West Translational Cancer Research Centre. The funders had no role in the design, analysis or writing of this article. Dr. Hébert owns controlling interest in Connecting Health Innovations LLC (CHI), a company planning to license the right to his invention of the dietary inflammatory index (DII) from the University of South Carolina to develop computer and smart phone applications for patient counseling and dietary intervention in clinical settings. Dr. Nitin Shivappa is an employee of CHI. The study received approval from the appropriate ethics committee and all participants provided informed consent. All named authors have read the manuscript and have agreed to submit the paper in its present form. The research has not been and will not be submitted simultaneously to another journal, in whole or in part. The paper reports previously unpublished work. All those named as authors have made a sufficient contribution to the work. Any specific consent to publish required by employers or funding bodies was obtained.